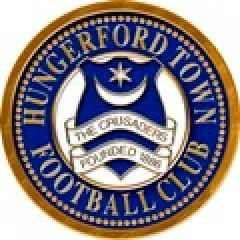 Hungerford were the best side from start to finish and nearly scored from an early corner that caused havoc in the Hampton box, the ball eventually falling to James Rusby whose shot was blocked. However they were soon ahead with Danilo Orsi-Dadomo scoring his third goal in three league appearances, shooting home through the legs of Tom Lovelock from Darren Foxley’s pass. Ryhs Murrell-Williamson had the visitors first shot on target with a tame effort comfortably saved by Jacob Weaver in the Hungerford goal. Orsi-Dadomo should have had his second of the afternoon, shooting wide from close range, with Foxley again the provider on the counter attack. Murrell-Williamson forced a good save from Weaver from a free kick just five minutes before half time. The Crusaders were once again on top after the interval and got the crucial second goal with just over 20 minutes to go. A Richie Whittingham free kick floated to the back post was headed in by an unmarked Joshua Martin, making his debut on loan from Birmingham City. The Beaver’s top scorer Chris Dickson had a late effort saved by Weaver but a poor performance cost them against a spirited and battling Crusaders side who saw out the game for a crucial three points.